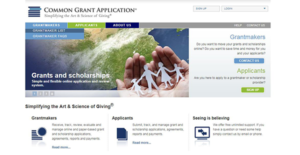 What is Common Grant Application? Common Grant Application is a full-featured, cloud-based grants management system built for scholarship providers, grant makers, and grant seekers. It is a simple and flexible solution that allows users to receive, review, track, evaluate, and manage online and paper-based grants and scholarship applications, payments, agreements, and reports. The platform is designed to be fully customizable, and it provides unlimited support and free training on how to install and use the solution for administrators and applicants. Common Grant Application simplifies the art and science of giving by supporting and expediting every facet of the grant lifecycle management. It supports a wide variety of grantmakers including community foundations, corporate foundations, family foundations, Adhoc groups of grantmakers, giving circles, scholarship providers, individuals, and public foundations. Some of its key features include application management, payment scheduling, reporting & analytics, real-time status update, and document management. This is a unified grants management system that allows you to manage applications, agreements, payments, and reports from one place. The solution lets you stipulate when, from who, and what types of application to receive. This makes it easy to receive and process paper-based and online applications while enabling you to reach a decision faster by simplifying the application evaluation process. When an application is approved, the information is availed to the grant maker almost instantaneously without compromising your control to privacy of this information. Most grantmakers in the modern era receive applications directly from the web. However, some funders continue to accept both online and paper-based applications and may require a versatile system such as Common Grant Application. This solution permits such users to enter paper-based applications and upload their corresponding documents directly into their system without a hassle. It makes it easy to integrate the paper-based applications into the database and make them part of the same workflow process as the online applications. Better still, the solution provides in-depth real-time status information about the applicants, grant, accounts, and grants reports. It also generates automatic emails based on the user configured settings to notify the grantmaker to changes in the status. On the other hand, any modification made to the application status is automatically reported to the applicant. If you are interested in Common Grant Application it may also be beneficial to analyze other subcategories of Best Grant Management Software listed in our database of B2B software reviews. There are well-liked and widely used applications in each software group. But are they automatically the best fit for your organization’s unique wants? A market-leading software application may have thousands of subscribers, but does it provide what you require? For this reason, do not blindly invest in popular systems. Read at least a few Common Grant Application reviews and consider the factors that you wish to have in the software such as the fees, main functionality, available integrations etc. Then, choose a few apps that fit your wants. Check out the free trials of these platforms, read online opinions, get information from the maker, and do your research systematically. This profound groundwork is certain to help you choose the best software platform for your company’s unique wants. How Much Does Common Grant Application Cost? Common Grant Application offers a simple enterprise pricing that entails a low monthly subscription fee. Contact the vendor to find out how much the service will cost. We realize that when you make a decision to buy Grant Management Software it’s important not only to see how experts evaluate it in their reviews, but also to find out if the real people and companies that buy it are actually satisfied with the product. That’s why we’ve created our behavior-based Customer Satisfaction Algorithm™ that gathers customer reviews, comments and Common Grant Application reviews across a wide range of social media sites. The data is then presented in an easy to digest form showing how many people had positive and negative experience with Common Grant Application. With that information at hand you should be equipped to make an informed buying decision that you won’t regret. What are Common Grant Application pricing details? What integrations are available for Common Grant Application? If you need more information about Common Grant Application or you simply have a question let us know what you need and we’ll forward your request directly to the vendor.